Here's another scene from Red Riding Hood. Which took way too long - especially since I don't like it as well as the one below. I like the contrast in the first one better than here. My hope is to make her home light and happy in contrast to what she'll encounter later on, but I feel like something's missing. Still, there are elements that work well. 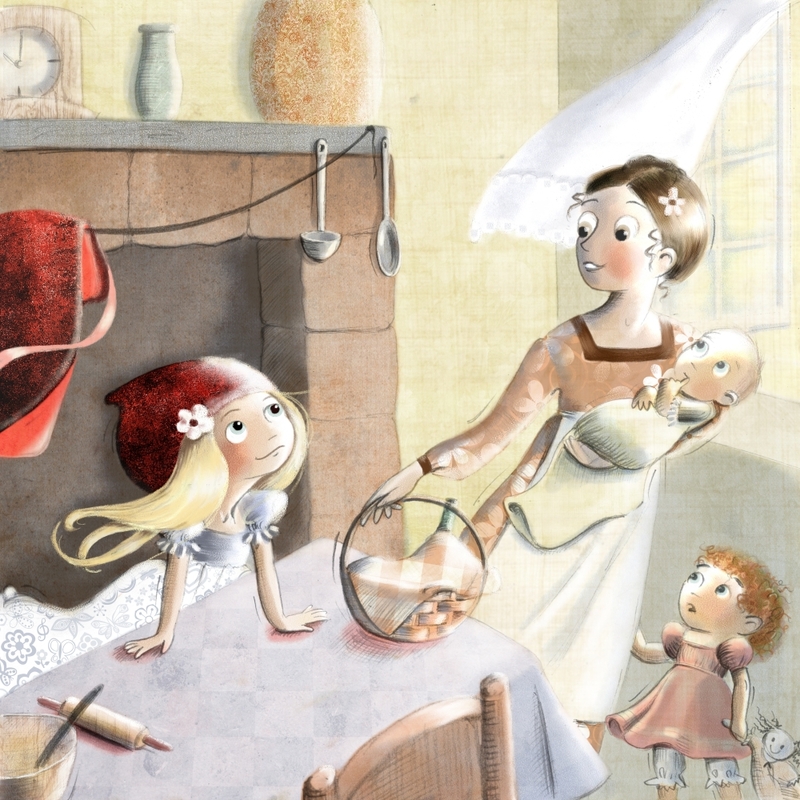 It took a lot of research to make the room and clothing look authentic, and to keep Red Riding Hood looking consistent. I also assumed it would come together quickly after that since I planned to use the same color palate as the other one. And then it took more time than I thought it would to determine which textures to use and where to put them! *sigh* But here it is, and now it's time for something else! Growing up, I often copied illustrations I liked (at least the parts in each image I liked best). 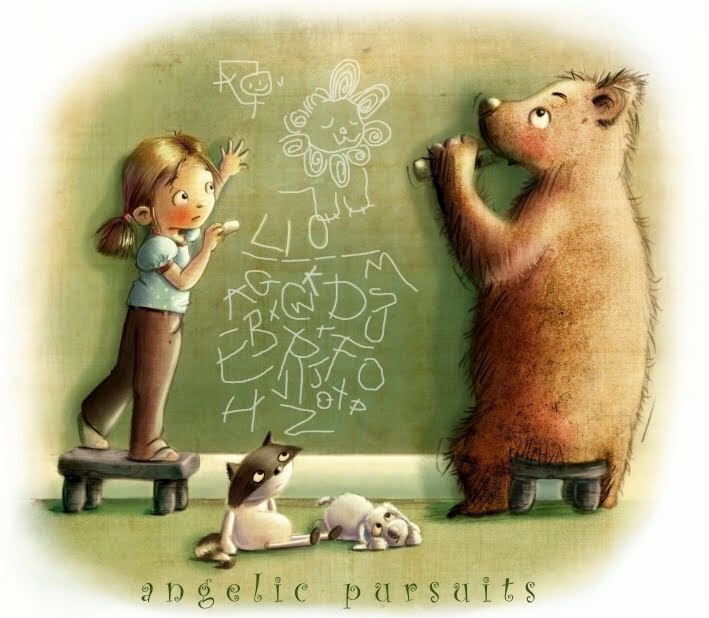 It became fairly easy to recreate what someone else had already done - which was good practice, but it was also deceptive since it didn't show the illustrator's behind-the-scenes work involved in creating the whole thing (or even that part I loved). Every illustrator is different, and every project can get more or less attention, but here's the behind my scenes process that went into creating this illustration (each step has correlating pictures), which I may submit it for the 2015 Tomie DePaola SCBWI contest. 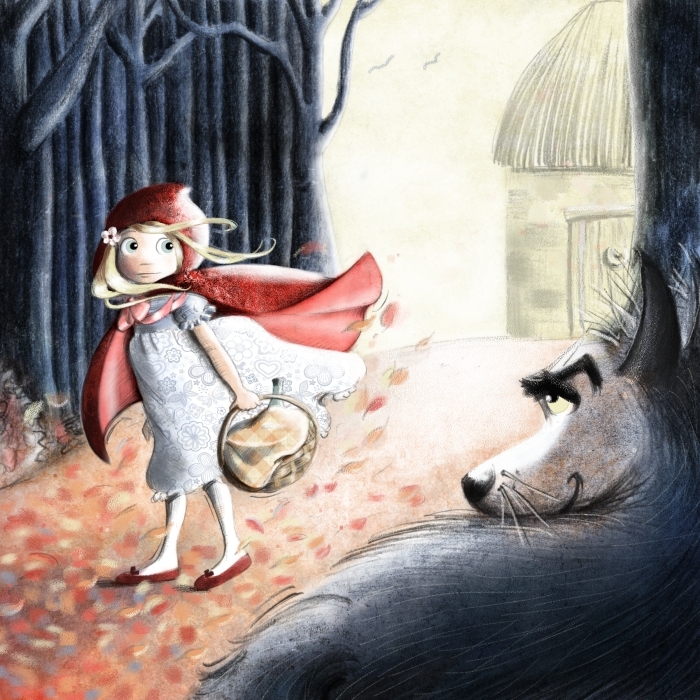 The prompt asked us to create an 8x8 illustration from a Red Riding Hood scene, with no space inside the illustration intended for text. Tomie's overarching goal is for us to create an illustration he falls in love with, most especially Little Red Riding Hood. 1. The first thing I did was some random brainstorming. 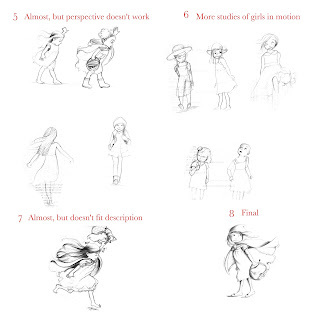 Sometimes this works great and I can skip some of the following steps, but since this brainstorming session wasn't creating a character I loved (though I do think the highly characterized little-miss-wonderhood - #3 - is kinda cute), I knew I had to do some research. 2. My random doodles proved that I didn't know how to draw capes very well, so I googled around and did a few studies from various angles. 3. 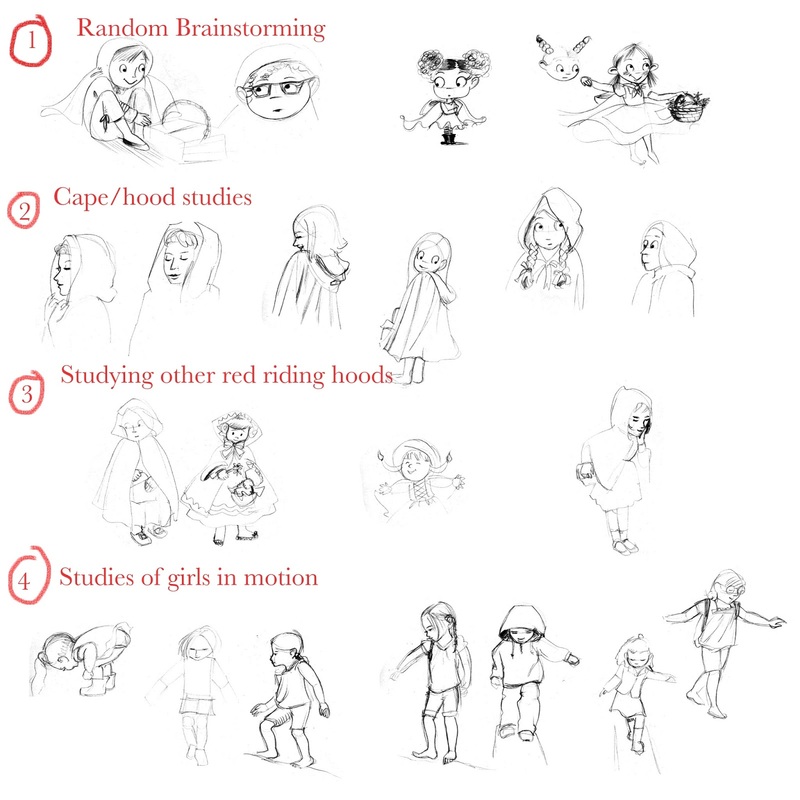 I also felt it would help if I studied how other illustrators have rendered Red Riding Hood, so I did more googling and sketching. 4. Since a lot of those Little-Red-Hoods felt stiff, I wanted to create more action in mine. I tinkered with the idea of having her walking along a log and - you guessed it! - sketched more studies of girls balancing on logs. 5. 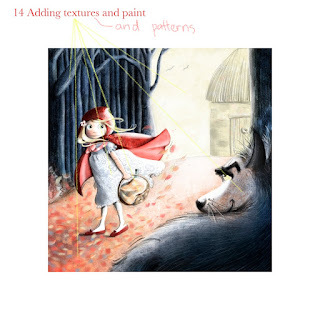 I chose a sketch I really liked and modeled this riding hood after her, but my wolf sketch (see #9 below) and idea for a layout didn't work with this, so I eventually scrapped this idea and . . .
6. Did more sketching! I thought my Little-Hood in #5 was cute, but I opted to create a European Riding Hood instead so that I could show her hair flowing in the wind. I also considered making her more modern, but since I have a fancy for those old fashioned spin-around dresses I opted for a more traditional look. 7. I loved the action here and almost used this Little Hood, but after re-reading the text prompt Tomie provided, I realized she's not the sort of girl who would recklessly zoom around with basket and goodies spilling out like I'd intended. So I reworked her and came to my . . .
9. 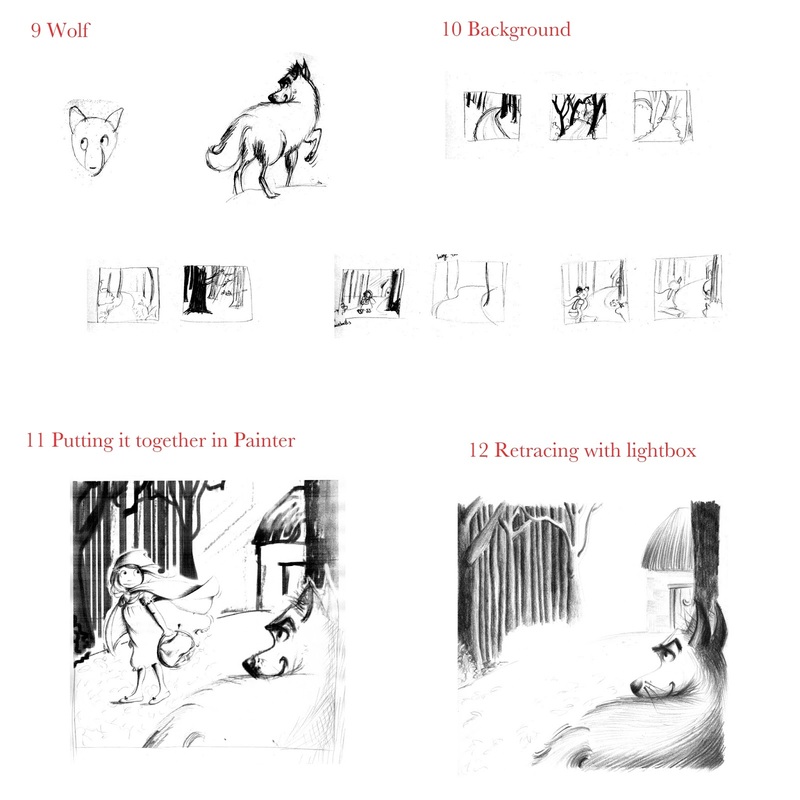 Toward the beginning of this process, I had already sketched the wolf (on the right). I've included a wolf face (on left) that I tried from my imagination so you can see the difference it makes to do your research! The attempt on the left helped me realize that I needed to - once again! 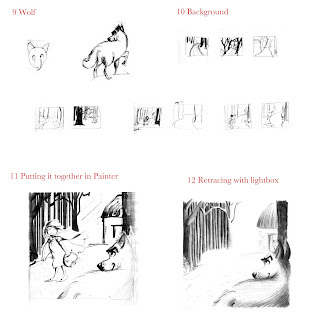 - sketch a real wolf to make it look authentic. In the end, I didn't need to do as many sketches since I knew I wanted him to be in the foreground looking over at her, and this came rather quickly. 10. After poking around, I sketched my favorite scenes of woods that might work for this illustration. I eventually used a combination of a couple I liked and added a little cottage to set the stage and add perspective. 11. Using the wonders of modern illustration technology, I brought everything into Painter to scale and place everything where it would deliver the most drama. Then . . .
12. I printed off #11 and retraced it with my lightbox. You'll notice Little Red is left out since I felt she looked great in #8 (and I was afraid of losing some of her freshness by retracing her). I then added her in once I rescanned #12. 13. 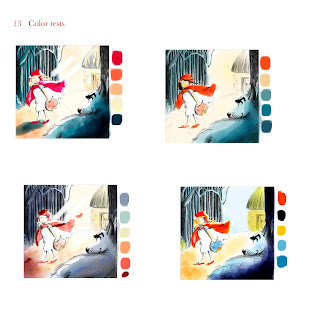 Using my super-duper Color Inspirations book, I found four color palates I thought might work. I knew I wanted a yellow sky, that Red would be red, and that the forest/wolf would be a more menacing blue. 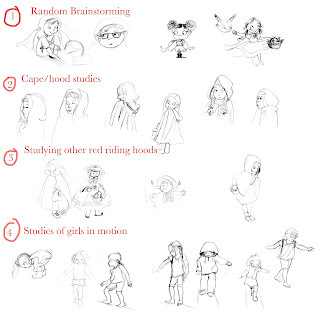 These parameters helped me narrow down what I wanted, and I did some quick studies in Painter with each one. Can you spot the palate I eventually used? 14. Last of all came my favorite part (or tied for favorite; I really like the sketching part, too): Adding textures and paint! I have a nice library of textures and patterns to choose from and have pointed out the areas where I used them. 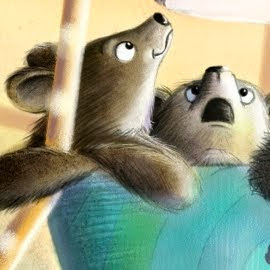 Not too long ago, my digital illustrations were mostly rendered with Painter's watercolor brushes, but I've since been adding textures - which I feel has changed my illustrations so much! (In a way, the process feels like cheating since it's more of a collage than a painting, but since the end product is what's most important, I choose this method since it creates the look and feel I'm aiming for.) After applying all the textures, I used some digital watercolor and pastel to add highlights and contrast. Voila! 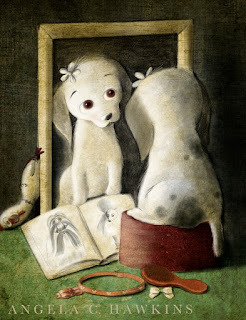 It didn't take long for me to decide what to draw for this month's SCBWI illustration prompt: Reflection. Thanks to being awake at 4:45, this idea came to me. And thanks to the idea, I had a hard time falling back asleep since I was so excited to execute my plan!